I frequently look at maps of Saint Paul. Call it a “blogupational” hazard. Sometimes I’ll plan a ride with the help of Google maps. Occasionally I’ll use an official City of Saint Paul paper map. Street maps from the mid and late- 1800s to the 2010s are invaluable for research. Whenever I write, I refer to the official map of the ride created by my GPS. Now and then a close inspection of a map reveals a puzzling or exotic feature that leads me to ride there. 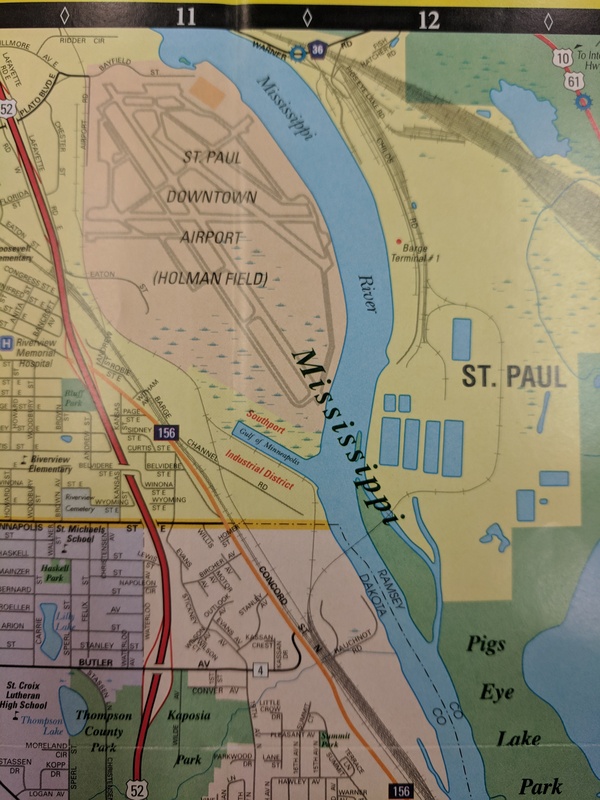 So it was that I inadvertently found on Google Maps a rectangular section of water jutting off the Mississippi River on the city’s West Side. I zoomed in until the unlikely name of this body of water – The Gulf of Minneapolis – appeared. Why would there be such an absurdly named place in Saint Paul? Could it have been faint praise to christen such a small and geographically insignificant spot after Saint Paul’s twin? Why isn’t this sliver of water on official City of Saint Paul maps? In addition to laying my eyes on the Gulf of Minneapolis, I hoped the ride would answer some of these questions. Before getting to the West Side, I passed through part of Downtown Saint Paul, which overwhelms me every time I ride there. Between the multitude of architectural styles, structures, the depth of history, and the variety of people, there is a plethora to shoot, research and write about. One example is the 15 foot tall tower at Kellogg Boulevard and Eagle Street. There is no marker, plaque, or cornerstone to explain what it is and why this exists. The stone tower on Kellogg Boulevard, next to Eagle Street. Xcel Energy Center is to the left. The slab is all that is inside the tower on Kellogg. I couldn’t find a plaque or marker anywhere. This unconventional construction project is to stabilize the bluff for future development. It is where the Ramsey County Adult Detention Center (jail) stood from 1979 until demolition began 2015. The pictures were taken from the north end of the Wabasha Street Bridge. Trucks sit where the old Ramsey County Adult Detention Center was. The buildings at the top are on Kellogg Boulevard. A closer look at the retaining wall reveals the complexities of the project. Originally the West Publishing building, it became a Ramsey County office building after West moved to Eagan. The building had several floors below ground because it was built from Shepard Road and up above the bluff along Kellogg Boulevard. My travels continued south-southeast via the Wabasha Street Bridge over the Mississippi River to the West Side, where Wabasha began to climb up the sandstone bluffs. I paused to consider the undulating retaining wall on the west side of Wabasha decorated with large letters. From this angle it’s difficult make out what is printed on the wall. But with a minor position shift the words come into view. As a nearby plaque explains, the words mean “home” or “house” in the languages of people who have called the West Side home over more than 150 years. This plaque details the history and design of the Wabasha Street Retaining Wall. Wabasha Street continues south-southeast, but in a couple of blocks, it abruptly becomes Cesar Chavez Street. Wabasha doesn’t end there. Rather, it peals off straight south at the same intersection. See the map below. Street signs pointing out the change from Wabasha to Cesar Chavez Street. The street name change at this corner isn’t new. Decades before being rechristened Cesar Chavez Street in honor of the late labor and civil rights activist, it was called Concord Street. Welcome to District Del Sol, or District of the Sun. The intersection of Wabasha, Cesar Chavez and Wabasha marks the western edge of District Del Sol, the main commercial area on the West Side, which has a distinctly Mexican flavor. Although I all but passed through District Del Sol, I did stop for a couple of the sites that make this part of Saint Paul distinctive and enjoyable to visit. Latino Charlie Brown from the Peanuts On Parade. District Del Sol is a part of the West Side, also periodically referred to as Riverview. Among the many artistic touches are unique, colorful garbage bins and benches. This unnamed “parklet” features art related to the Latino-influences of the West Side. There is a small, semicircular “parklet” formed by the curved intersection of Cesar Chavez and Wabasha Streets. This unlabeled space consists of a handful of shrubs, a couple dozen diminutive clay works and a wall of frescoes. Some of the clay tiles in the concrete. The focal point of the wall of frescoes is a relief of the Smith Avenue High Bridge. The High Bridge has had enormous significance to the West Side since the original bridge was built in 1888-89. That bridge connected the upper bluffs to Downtown Saint Paul for the first time, opening it to settlement by European Americans. Frescoes decorate the walls on both sides of the High Bridge relief. Frescoes on the right, west, side of the High Bridge relief. Another example of the colorful West Side is the paintings on the Boca Chica restaurant. WREY Radio Rey (The King), a Spanish language radio station that most in the Twin Cities have never heard, is on Cesar Chavez Street in a former gas station. Radio Rey can be heard on 630 AM and 94.9 FM. From Radio Rey I followed Cesar Chavez Street east for a mile, in which time it became Concord Street. A left turn on Barge Channel Road brought me to the entrance to the Saint Paul Port Authority’s Southport River Terminal, and closer to the Gulf of Minneapolis. The Southport River Terminal is highly industrial. Built in 1964 by the Port Authority, it’s not surprising that the 99 or 119 (depending upon the source) acres of land here align with the idea city planners had in the 1960s – that the property along the Mississippi River was great for industry, not recreation. More than 50 years later, little has changed in the use of the land within the Southport River Terminal boundaries. In fact, the Port Authority hopes to increase not only barge traffic, but railroad access by extending existing tracks. Southport is less than a quarter mile from homes and apartments, and not much farther from a church and school. West Side residents concerned about environmental, health and safety issues at Southport, pushed the city for a study of air quality resulting from the heavy industry. The Southport Industrial District Study began at the end of 2015 and was released just over two years later. The study supported residents’ concerns about air quality and among the 14 recommended was reducing dust and the idling of trains and trucks. Industry and the jobs they create are important for Saint Paul. 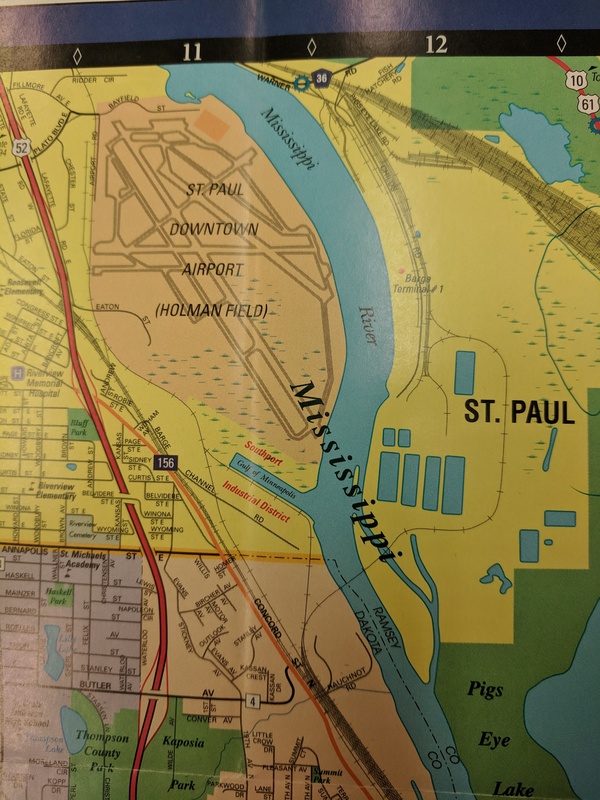 My trepidation is about the location of the Southport Terminal, as the West Side is predominately home to people below Saint Paul’s median income. Some online maps identify this short segment of road as Witham Avenue and Don Empson, in his carefully researched and invaluable “The Street Where You Live,” says Witham Avenue was vacated by the city in 1972. Barge Channel Road, the only street within Southport Terminal, is loathed by nearly all who know it. That’s because Barge Channel Road is the location of one of two of the police department’s infamous impound lots. A source of great angst and anger is the Saint Paul Police Department’s Impound Lot. Many a careless, lazy or uninformed auto owner has had her or his car towed to 830 Barge Channel Road for a snow emergency violation. Should you have the misfortune of getting your vehicle towed to this lot, it’s going to set you back a minimum of $56 for the parking ticket that got you towed plus at least $266 more to get your car back. The view of the impound lot through the main gate. A few of what seemed to be hundreds of cars at the Barge Channel Road impound lot. Vehicles of a multitude of makes, models, styles and conditions, sit in the lot. None look showroom new, however. Barge Channel Road ends in a cul-de-sac, which is where the impound lot office is. The impound lot office, like the lot itself, is protected by fencing. While photographing the impound lot I was questioned twice by employees who were suspicious of my activities, even though I stood on the public right-of-way at all times. Looking northwest at Barge Channel Road from the cul-de-sac at the eastern end of the road. The impound lot office was behind me. The Southport River Terminal is dominated by metal recyclers. Despite its proximity to the Mississippi River, it’s not a place with much of a view. With the volume of scrap and other trappings of industry, it is no stretch to call this area unsightly. Alter Metal Recycling at 801 Barge Channel. Scenic the Southport Terminal is not. ADM (Archer Daniels Midland) Fertilizer has by far the largest and most conspicuous structure on Barge Channel Road thanks to its unusual silhouette and size. It stands out even with the grey sky. The ADM Fertilizer building is popular with the local pigeons. A better look at the pigeons on the roof of the ADM building. Gerdau is another metal recycling plant on the road. And across the street at 521 Barge Channel Road is Northern Metal Recycling. Next door is Hawkins Terminal 2, an innocuous name for this chemical distribution facility. The tall fences topped with barbed wire belie the potentially dangerous nature of the ferric chloride liquid stored here. Ferric chloride liquid is used to treat sewage, produce drinking water and to etch copper-based metals in printed circuit boards. Chemical storage tanks are clustered on the east side of Hawkins Terminal 2. Just east of Hawkins (tanks in the background) is Alter Metals Recycling – perhaps the most ambitious of the recyclers on Barge Channel. Small mountains of metals, much of it unrecognizable and in various states of rusting, cover Alter Metals’ property. In a nearby pile, awaiting further processing, were pipes, motors, fencing, springs and other larger pieces of scrap. Although close in proximity to the Gulf of Minneapolis, numerous man-made and natural barriers obstruct the view. The Gulf of Minneapolis, northeast of Barge Channel Road, isn’t easy to see from the street. Most of the businesses, or fences surrounding them, block the view of the Gulf. In the occasional spot without either, trees obscure the Gulf. However, it’s not hard to get there with a little effort. Several driveways and parking lots were open, which allowed me to ride up to the water. Obviously, the Gulf of Minneapolis is a man-made channel for pickups and deliveries of scrap metal, chemicals for water treatment and other commodities. Looking southeast at the Gulf of Minneapolis. The main channel of the Mississippi River flows in front of the trees in the background. The northwest part of the Gulf of Minneapolis, where barges and tugs dock with their loads of commodities. The large building is ADM Fertilizer. Two tugs sat idle, awaiting Monday and barge traffic. After pondering this, my guess is that the Gulf of Minneapolis was placed on Google Maps by a practical joker who perhaps lives in Minneapolis, or a person having some fun with Google Maps. The explanations fit with the absence of the name on official city maps. So the trip to the Gulf of Minneapolis allowed me to experience another part of Saint Paul to which I’d never traveled. I saw the Police Impound Lot on my terms, and learned about the heavy industrial businesses unique to the Southport River Terminal. I’ll probably never know for sure how the Gulf of Minneapolis was attached to the port, but it was a great way to get me to that part of Saint Paul. Here’s the map of this ride. Thanks for doing this! I love exploring the history of these sorts of places. The Gulf of Minneapolis also appears on OpenStreetMap, but not on Bing Maps. Upon further inspection in OpenStreetMap it seems the source of the geometry is NHD (National Hydrological Dataset, a product curated by USGS). However, I downloaded the GIS data from NHD for St Paul and the Gulf of Minneapolis was nowhere to be found! My guess is that when Google and OpenStreetMap ingested NHD the Gulf of Minneapolis was listed as a distinct feature in the dataset but has since been removed, yet the name and location can still be found in GNIS. There is an official process that you must go through to be listed in GNIS (and I believe there has to be agreement from a board of people at USGS), so I’m wondering if the owner of one of those recycling plants is also a geography nerd and wanted to have some fun. Anyways, thanks for pointing out this local oddity! The Library of Congress appears to have both a first edition of this map from 2002 and a second edition from 2004. (Maybe the latter is the “circa 2005” cited by GNIS.) If some enterprising streets.mn reader finds themselves with some time to kill in Washington, DC, they might stop by the Geography & Map Reading Room in the Madison building, room LM B01 to see whether the Gulf of Minneapolis was already on the 2002 edition or newly showed up on the 2004. Max, thank you for sharing this information. Perhaps a trip to DC is in order. I appreciate your regular comments and am glad to see your strolls in Minneapolis continue to enlighten your readers. Looks like the Northern Dakota County Chambers of Commerce may be defunct, having given way to the Dakota County Regional Chamber of Commerce. Also, I note that the Gulf of Minneapolis is just outside of Dakota County. So if the name originated with the chamber and not with their hired cartographers at NovoPrint, then they may have been having a bit of extra fun by bestowing it upon their neighbors to the north. John, great insight into the truth behind my speculation about the naming of the Gulf of Minneapolis! This is fascinating information. Thank you for the time you took researching and posting. BTW, St. Paul dropped the name “Gulf of Minneapolis” as the significance of Minneapolis faded over the years. Tom, I laugh every time I read your comment. Bravo! And thanks very much. The “Gulf of Minneapolis” does not appear in any historical newspaper archives. If you search “Gulf of St. Paul” it appears at the same place as the Gulf of Minneapolis. Thanks for this article! I actually have noticed the gulf of Minneapolis on Google maps. I saw it several years ago. I have explored this gulf via canoe, it is equally as unappealing on water as on land. Thanks again and I look forward to more of your articles in the future. Hey Adam, great information! I’d love to talk to you about your canoeing of this part of the Mississippi River. Sounds like you and your travels on the river would make an interesting story. Contact me if you are interested. This is an incredibly powerful article. Lucas, thank you very much for your comment and for reading the blog! In 1972-3 I worked for Proform, a company that built fiberglass barge covers for river barges. These barge covers were large curved “plastic ” arches built on molds and then assembled with cranes directly on river barges moored alongside the factory’s “backyard” on barge channel road. Building the fibreglass arches was one of the worst jobs I ever had. Assembling the finished panels, however, was one of the best Jobs I ever had. I recentry visited barge channel road, but did not recognize where the Proform premises were. Hi John. Interesting story that will lead me to do some more research. I’ll post an update if I come up with information about Proform. A question: how do the tall fences topped with barbed wire disguise or contradict the potentially dangerous nature of the ferric chloride liquid stored here? Hi Peter. Thank you for your comment and question. Good catch on the incorrect verb I used regarding the barbed wire. They aren’t frescoes, they’re relief carvings. Fresco is painted into wet (fresh: fresco in Italian) plaster. These works are carved in stone. The artist is Craig David. Hi Robert. Thanks for the correction and information about the artist. I’ll update the post later today. Obviously my knowledge of art needs to improve! I know and love Barge Channel Road well. For one, it’s a great name. It has a gritty, industrial feel to it. And I think cities still need places like this. And I’ve made more than a few trips there to sell copper. There used to be a scrap yard on University just east of 35E. But if you want a better price, you need to go to a place where homeless people can’t walk to; that’s a captive market that kept the price down at Kaplan’s on Uni. Great Western has Saturday morning hours, which Alter does not. But if I went during the week, I always go to Alter. It’s usually slower and quicker to get in and out. My fond view of Barge Channel Road comes despite my first encounter with it. My older brother got drunk and smashed one of our cars into a parked car, and it was towed there to the impound lot. Dad and I went down there to get personal items out of it. Then we went to one of the scrap yards to have it towed and scrapped there. This was on Monday evening, after Dad got the call from the police about midnight, a great way to ring in Father’s Day that year. I was 17, and I suppose Dad had the ulterior motive of showing me the effects of drunk driving. I can’t recall if it was from the head of my brother, or his drinking companion (now a high ranking civil service employee of the City of Saint Paul), but there was hair stuck in the cracked windshield from where one of their heads contacted glass. Drinking and no seat belts! Hi Frank. Those are a couple of great stories you added! Thank you for sharing them. Your dad handled your brother’s misdeed well, at least as it applied to you. Did that incident affect your drinking and driving as a young person? And what about your brother. One other thing. Are you any relation to the notorious Edward Phalen?